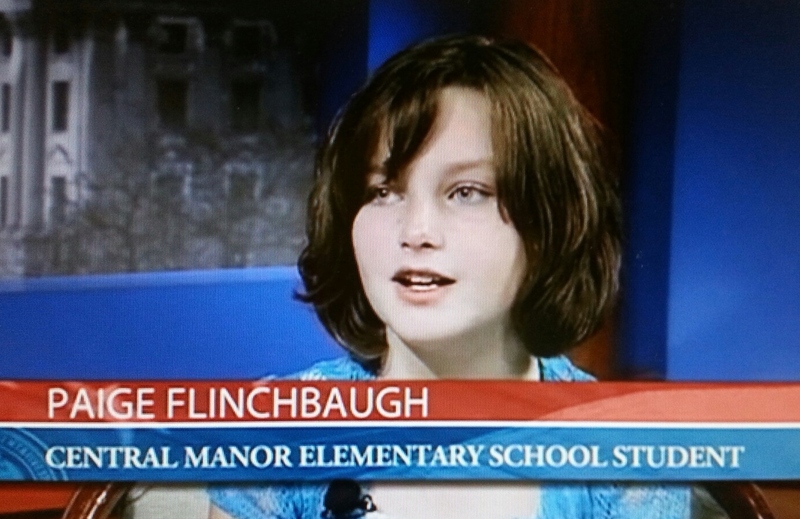 Student Voices features article and writing from Penn Manor students. It’s time to fight cancer by putting on your pink! Penn Manor School District is participating in a Pink Out to raise money for cancer research and support groups. All fall sports teams are selling T-shirts to support this cause. In addition, a district-wide Pink Out dress-down day will be held Oct. 9. Last year, Penn Manor students, staff, families and community members raised $8,000 to benefit such organizations as the American Cancer Society, Help the Fight, the Ann Barshinger Cancer Center and the LG Health Cancer Support Fund. Athletes are taking orders for “Comets FIGHT for a Cure” Pink Out shirts. A printable order form is available below. Shirts also will be sold for $10 apiece during lunches in the Penn Manor High School cafeteria. Purchasing a T-shirt allows staff members to wear jeans on Friday, Oct. 9. Penn Manor staff also can participate by donating $5 to their building secretary and wearing their own pink attire on Oct. 9. Sports teams will be accepting donations and taking T-shirt orders at all home games. They also have designated contests as Pink Out games, where additional money will be raised through bake sales and other activities. Proceeds will benefit Children’s Miracle Network, Help the Fight, the American Cancer Society and the Marticville Marathoners Relay for Life team. Boys’ soccer – Oct. 15. If the field hockey team raises at least $1,000, coach Denise Gobrecht has agreed to be crowned Pink Queen, complete with pink cape and crown. Please consider supporting this fun and worthwhile cause! Penn Manor High School will host a districtwide K-12 Art Show from 5 to 8 p.m. Thursday. All are welcome to attend the show, which will include hundreds of pieces of artwork by students in every grade level attending every Penn Manor school. The artwork will be on display in the art wing of the high school. The entrance is across from the Millersville University football field, next to the greenhouse. 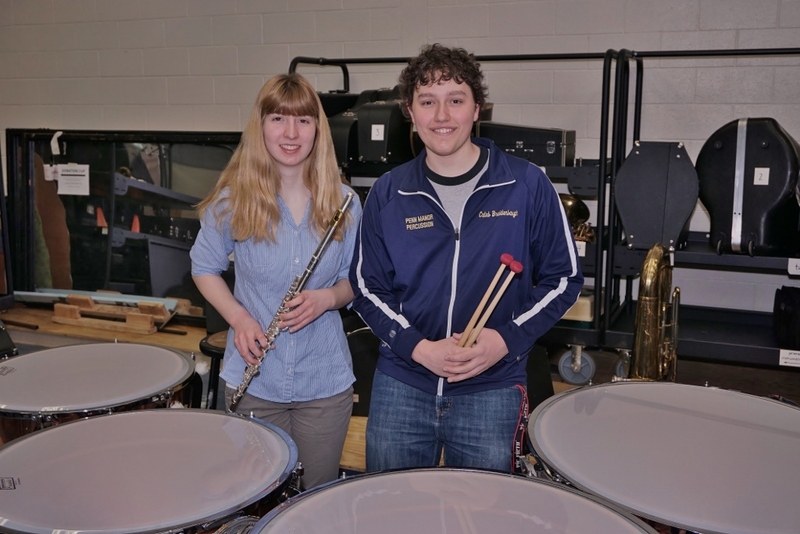 Come out and experience the exceptional talents of Penn Manor students! U.S. Rep. Joseph Pitts recently honored a Penn Manor High School senior by recognizing her artistic accomplishments in a citation read into the official Congressional Record. It’s the latest honor for Alessandra Levato, who last year earned a $10,000 scholarship for her winning painting in a nationwide art competition. Pitts, an artist himself, met with Ali this month in his Lancaster office, where he presented her with a copy of the congressional citation after looking over her art portfolio. Ali recently was chosen to create two 12-foot paintings for the Pennsylvania School Boards Association’s Mechanicsburg headquarters. The abstract paintings incorporate words from the PSBA’s core values. Last year, she won the 2013-14 Young American Creative Patriotic Art Contest. Her oil painting, “To Be An American,” placed first among the more than 4,000 entries submitted in the nationwide contest, sponsored by the Ladies Auxiliary of Veterans of Foreign Wars. In addition, she has received numerous art awards while at Penn Manor, including several Scholastic Art and Lancaster County Young Artist awards. After graduation, Ali plans to attend either the Pratt Institute or Rhode Island School of Art and Design. Congrats, Ali, and best wishes on your future endeavors! Congratulations to the 14 Penn Manor students who won awards for outstanding writing in the 2014-2015 Lancaster County Scholastic Writing Awards competition, sponsored by Lancaster Public Library. Another student, Veronica Cazillo, a high school freshman, won first-place for an editorial in the Newspaper in Education writing competition. Penn Manor students won 16 Scholastic Awards, including seven Gold Keys, the top honor. The students will receive their awards during a ceremony beginning at 8 p.m. March 13 at Spooky Nook Sports Complex. 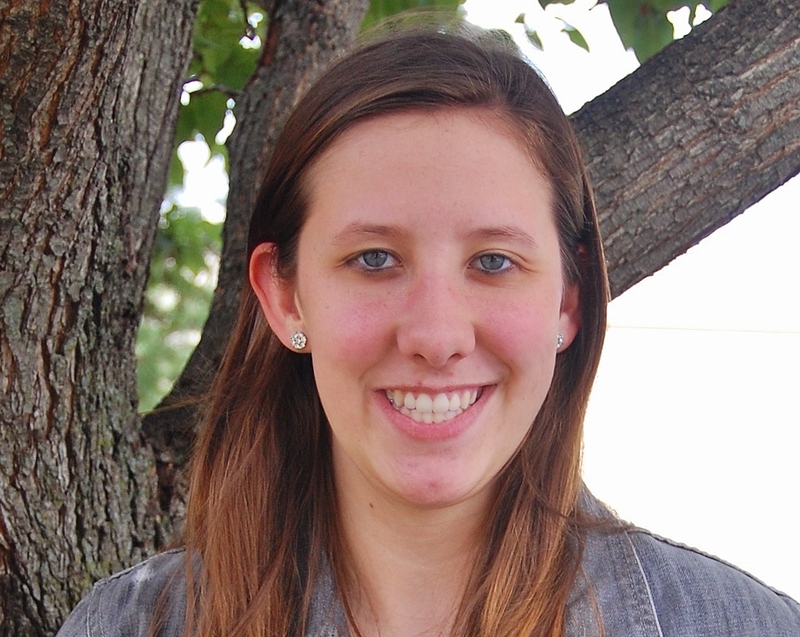 Elizabeth McIlhenney – Gold Key for short story “Remembrance”; Honorable Mention for writing portfolio. Ashley Seiger – Honorable Mention for poetry collection. Alysse Owens – Honorable Mention for poetry. Congratulations to the students, and their teachers: Chris McKnight, Deb Goodhart, Ann Grosh, Carrie Aukamp, Cece O’Day, Brian Reinking, Lisa Mayo and Lisa May. Dec. 9, 7 p.m. – Central Manor Elementary School Holiday Concert, featuring third-graders, band and strings. Directors: Sarah Repkoe, Konrad Fritz. Dec. 11, 7:30 p.m. – Manor & Marticville Middle School Combined Holiday Concert, Penn Manor High School, featuring the middle school band, strings and chorus. Directors: Lauren Forbes, Andrew Johnson, Sara Masten and Skip Reddig. Dec, 12, 9:30 a.m. – Conestoga Elementary School Holiday Assembly, featuring the band and chorus. Director: Jill Almoney. Dec. 12, 9:15 a.m., and Dec. 13, 10 a.m. – Martic Elementary School Holiday Concert, featuring third graders, band and chorus. Director: Allan Dutton. 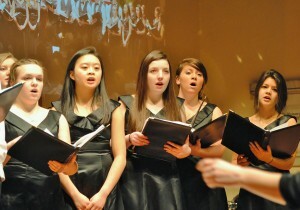 Dec. 12, 4:30 to 6 p.m. – Manor Singers performance, Stauffer’s, Rohrerstown Road. Director: Lauren Forbes. Dec. 13, 10 a.m. to noon – Manor Singers and String Ensemble performance, Darrenkamps, Willow Street. Directors: Lauren Forbes and Sara Masten. Dec. 13, 7:30 to 8:30 p.m. – Manor Singers performance, Candlelight Tour, Conestoga Historical Society, Kendig Road. Director: Lauren Forbes. Dec. 15, 5:15 p.m. – Elementary Strings Presentation, Pequea Elementary School. Directors: Konrad Fritz and Sue Hamer. Dec. 16, 5:30 p.m. – Pequea Elementary School Holiday Concert. Director: Sue Hamer. Dec. 17, 7:30 p.m. – Penn Manor High School Holiday Concert, featuring the high school band, strings, chorus and Manor Singers. Directors: Lauren Forbes, Andrew Johnson and Sara Masten. Dec. 18, 9:30 a.m. – Eshleman Elementary School Holiday Assembly, featuring the band, chorus and strings. Director: Jill Almoney. Dec. 18, 5:30 p.m. – Hambright Elementary School Holiday Concert. Director: Lee Jordan. Dec. 22, 2:15 p.m. – Letort Elementary School Holiday Assembly. Director: Konrad Fritz. Snow date/time is Dec. 23, 9:15 a.m.
Penn Manor High School student Alessandra Levato has earned a $10,000 scholarship by winning the 2013-14 Young American Creative Patriotic Art Contest. Her oil painting, “To Be An American,” placed first among the more than 4,000 entries submitted in the nationwide contest, sponsored by the Ladies Auxiliary of Veterans of Foreign Wars. The painting depicts a line of people being sworn in as new citizens of the United States, some of them clutching small American flags. Alessandra said she “tried to capture the moment of the American Dream” with her composition. “In thinking about how many different ethnic groups make up the citizens of the United States, I thought it would express patriotism by painting the exact moment when a person consciously makes the choice to become a citizen of America,” she said. Alessandra qualified to compete nationally after winning a local contest in March sponsored by the Ladies Auxiliary to Lititz Springs VFW Post 1463 in Lititz. She then went on win to the state competition. “To Be An American” was one of 47 entries to make it to the national level of the contest. Her painting will be featured on the cover of the Ladies Auxiliary of Veterans of Foreign Wars Magazine and on the organization’s website. In addition, she and her father will be flown to St. Louis to attend the auxiliary’s national convention July 21, where she will receive her award. Alessandra, who will be a senior in the fall, is the daughter of Larry and Lee Levato of Manor Township. While at Penn Manor, she has received numerous art awards, including several Scholastic Art and Lancaster County Young Artist awards this past year. 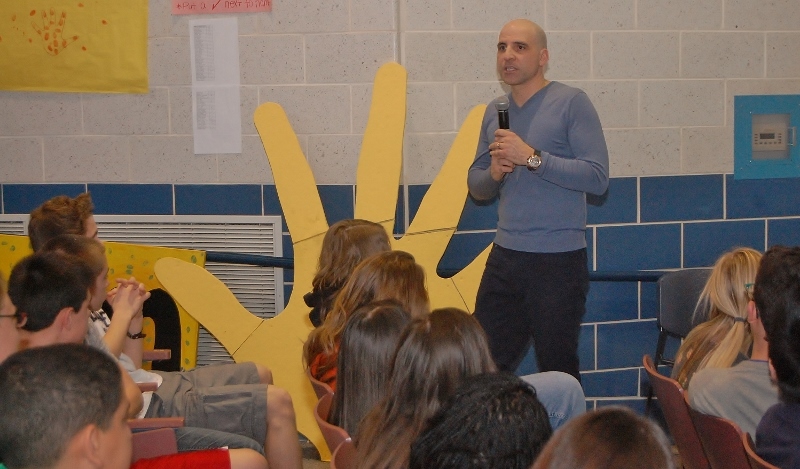 Representatives of the Aevidum organization visited Penn Manor middle schools Monday to generate support for the student club, which seeks to raise awareness about depression and suicide and create a culture where students feel supported by their peers and teachers. 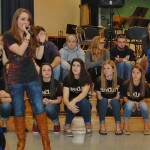 Special guest Stephanie Grace, a country singer/songwriter who has opened in concert for Taylor Swift, sang for the students at Manor and Marticville middle schools and expressed her support for Aevidum. She talked about overcoming her fears about singing in public and urged students to transcend their fears and let their talents blossom. Members of the Penn Manor High School Aevidum Club spoke to the audience about the positive effects of the club, which was established last fall. “Middle school doesn’t define you, but it’s a good place to start to define yourself,” one student said. 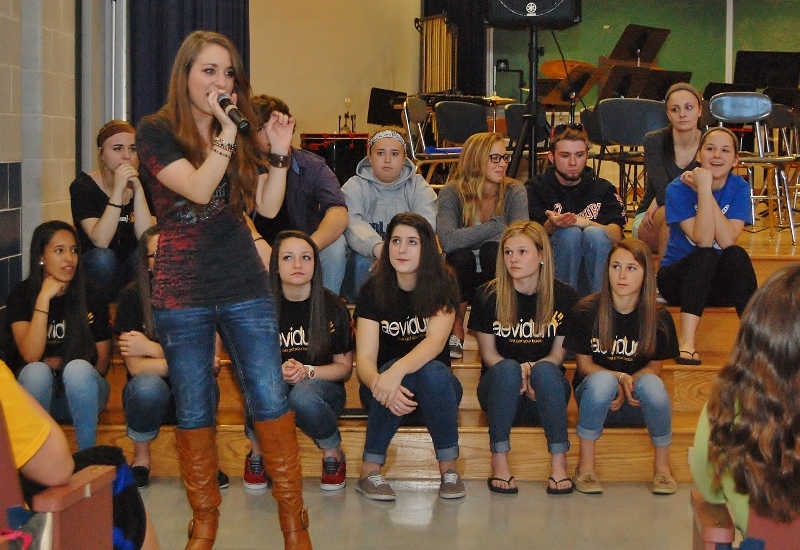 The organization’s founder, Joe Vulopas, explained how Aevidum was started following a student suicide at Cocalico High School in 2004 and now has a nationwide reach. He urged students to pool their interests, creativity and talents to support each other through Aevidum. “Let’s make this culture one where we care for each other and truly have each other’s backs,” he said. 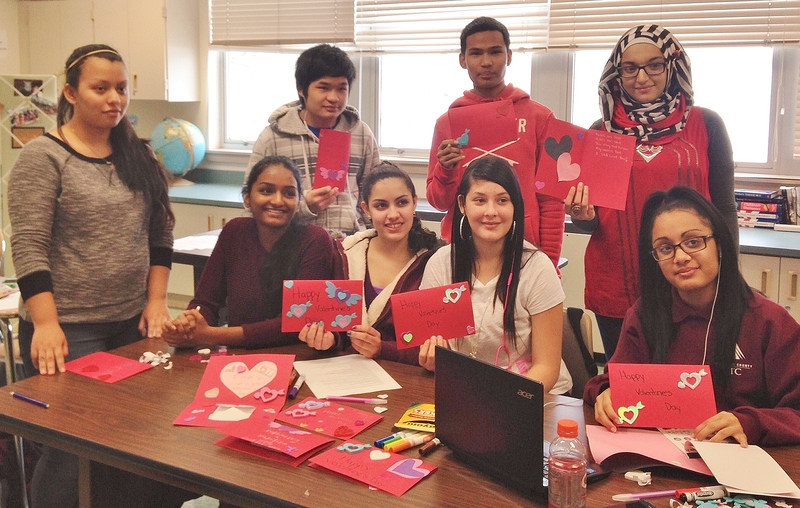 Both Manor and Marticville middle schools are planning to establish Aevidum Clubs for the 2014-15 school year. Stephanie Grace sings “Loser” at the assembly at Manor Middle School Monday. 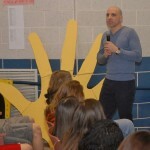 Aevidum founder Joe Vulopas explains the yellow hand symbol, which represents how Aevidum students support one another. 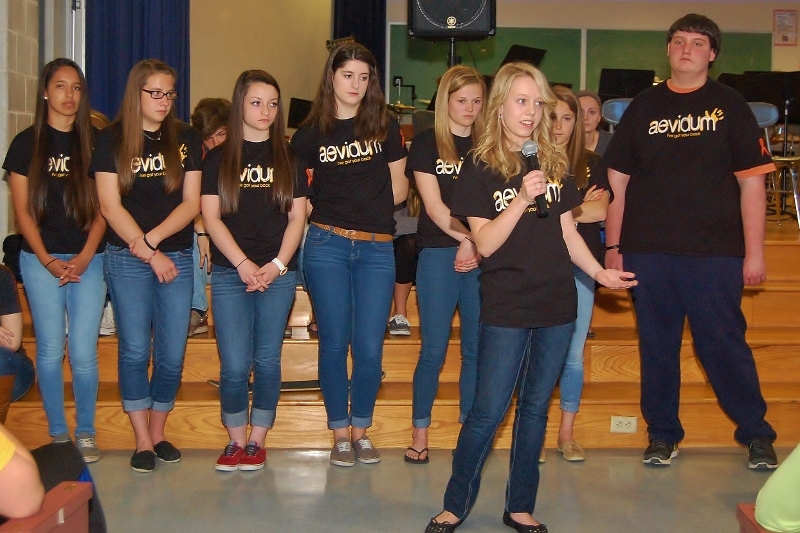 Penn Manor HS senior Victoria Jones addresses students at Manor Middle School as other HS Aevidum Club members look on. 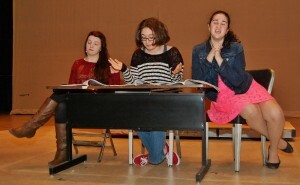 Penn Manor High School’s drama department often presents a spring play that appeals to younger children, but this year, it decided to tackle a show with more mature themes relating to a new student organization at the school. 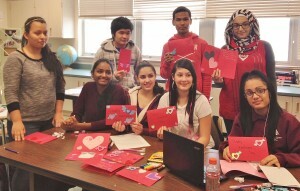 Called Aevidum, the club was formed this year to raise awareness about teen depression and suicide and create “a culture of caring” in which students watch out for each other. This year’s play, “The Locker Next 2 Mine,” ties into those themes. 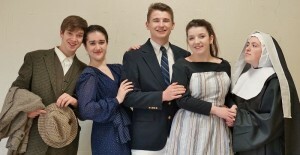 To be presented April 11-12, the play focuses on Alisa, a student entering a new high school in the middle of her junior year. Her locker is next to a sprawling shrine for Beth, a lacrosse player who died a year earlier in a car accident. While the school is in a state of non-stop remembrance for Beth, Alisa learns that there was another student death that no one is talking about – and it’s left many of the school’s students trying to pick up their own pieces. “Locker” takes an unflinching look at bullying, teen suicide and dealing with loss. Because of the mature themes and language, the play is not suitable for younger children. 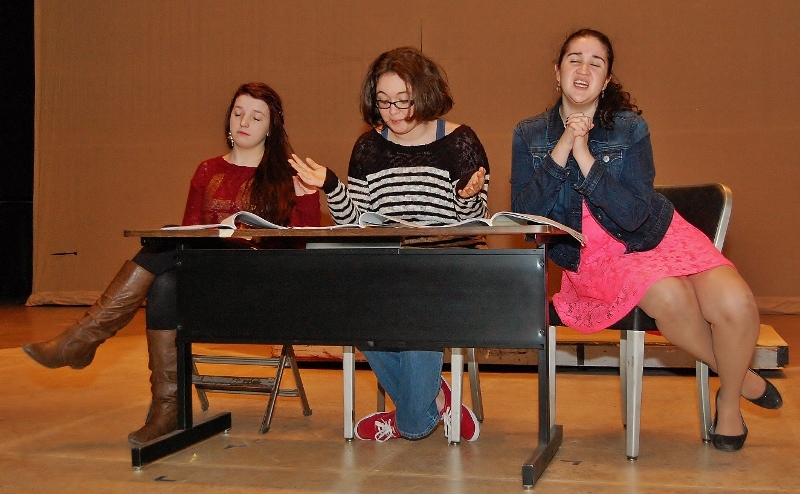 “Locker” will be performed at 7:30 p.m. April 11 and 12 in the Penn Manor High School auditorium. Following the shows, the playwright, Jonathan Dorf, will engage the audience in an open discussion about issues raised in the play. Tickets are $2 for students and $5 for adults. The ticket order form is available here. Penn Manor High School senior Toby Holsinger can add a new title to her name – published author. 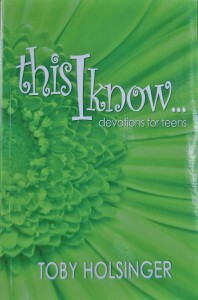 The Mountville teenager wrote “This I Know … Devotions for Teens,” a book of 90 daily devotions that was recently published by Cross River Media and is available on Amazon.com. Each short story in the book covers a different topic, including bullying, gossip, forgiveness, grief and patience. For each day’s devotion, a different girl finds herself in a difficult situation. The book then offers advice on overcoming the difficulties with prayer and inspiration from Scripture. While the characters and scenarios are fictional, Toby said she was able to draw on her real-life encounters, and she wrote the book specifically for teens like herself, with their unique experiences and struggles. Toby began working on the project in 2012 after a poem she wrote caught the attention of her high school English teacher, Lisa Mayo. Toby posted the poem, about a frightened child running to her father’s arms during a storm, on Facebook. A relative of Toby’s who is a professional writer shared the poem with a publisher, Cross River Media, which took an interest in Toby’s writing. 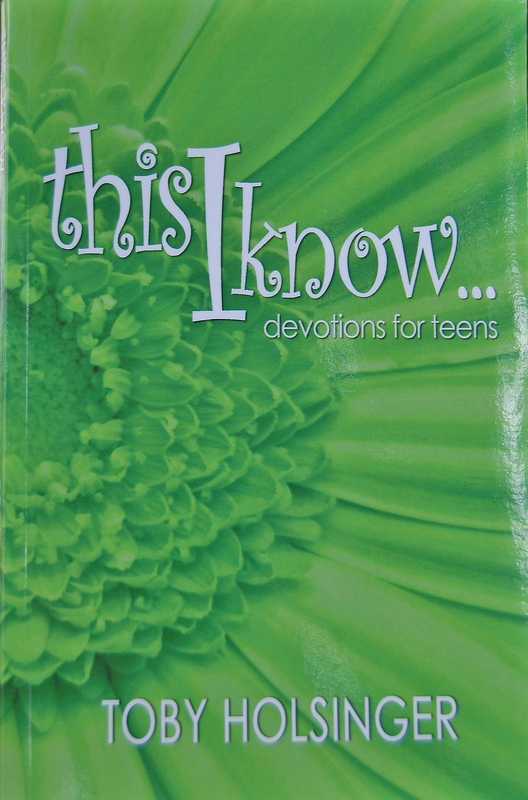 The devotions book began taking shape, and after a series of edits, rewrites and a title change, “This I Know” was released this fall. Toby will participate in a book signing fundraiser with another local author Dec. 3 at Uncle Leroy’s Candy Shop in Strasburg. She is under contract with Cross River for five years but does not have another writing project in the works at the moment. After graduation, Toby plans to attend Lancaster Bible College and major in social work. On October 22nd, the Comet Chorus will be hosting ‘A Night at the Hop’. You can expect to find a 50’s style café serving the famous café burgers, fries, and even milkshakes. The chorus will be performing hits from the 50’s throughout the night. Cost is $25 per person over the age of 5. Young children are not recommended due to the busy atmosphere, but are welcome to come. All proceeds go towards the Chorus trip to Hawaii, were they will be singing at the 70th Anniversary for Pearl Harbor. Tickets can be purchased from any chorus student or by contacting Mrs.Telesco at Melissa.telesco@pennmanor.net. So come on out and enjoy ‘A Night at the Hop’.